It was just another Donald Trump campaign event, and the candidate had affirmed his previously made pledge not only to kill terrorists but to “take out” their family members, too. Outrageous as that might sound, it hardly distinguished Trump from most of his Republican rivals, fiercely competing over who will commit the worst war crimes if elected. All the chilling claims about who will preside over more killings of innocents in distant lands—and the thunderous applause that meets such boasts—could easily be taken as evidence that the megalomaniacal billionaire Republican front-runner, his various opponents, and their legions of supporters, are all crazytown. Yet Trump’s pledge to murder the civilian relatives of terrorists could be considered quite modest—and, in its bluntness, refreshingly candid—when compared with President Obama’s ongoing policy of loosing drones and US Special Operations forces in the Greater Middle East. Those policies, the assassinations that go with them, and the “collateral damage” they regularly cause are based on one premise when it comes to the American public: that we will permanently suspend our capacity for grief and empathy when it comes to the dead (and the living) in distant countries. 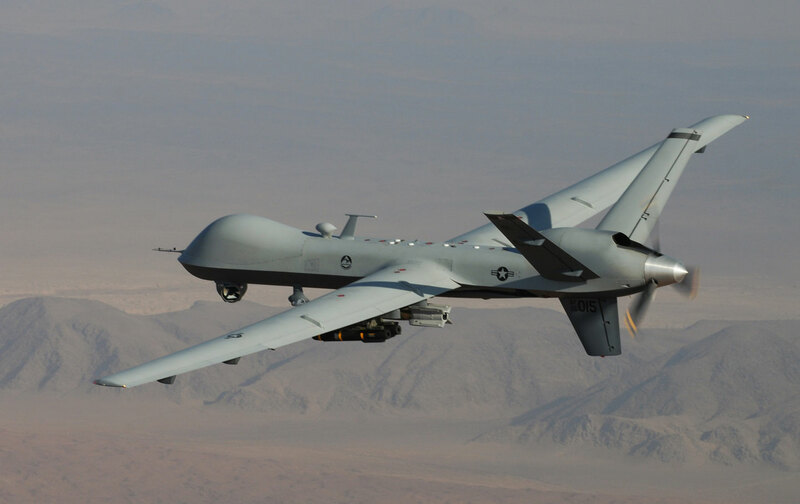 Orders then make their way down to drone operators somewhere in the United States, thousands of miles from the individuals slated to be killed, who remotely pilot the aircraft to the location and then pull the trigger. But when those drone operators launch missiles on the other side of the world, the terrifying truth is that the United States “is often unsure who will die,” as a New York Times headline put it. That’s because intel on a target’s precise whereabouts at any given moment can be faulty. And so, as the Times reported, “most individuals killed are not on a kill list, and the government does not know their names.” In 2014, for instance, the human-rights group Reprieve, analyzing what limited data on US drone strikes was available, discovered that in attempts to kill 41 terror figures (not all of whom died), 1,147 people were killed. The study found that the vast majority of strikes failed to take down the intended victim, and thus numerous strikes were often attempted on a single target. The Guardian reported that in attempts to take down 24 men in Pakistan—only six of whom were eventually eliminated in successful drone strikes—the United States killed an estimated 142 children. I admit to a failing here: When I notice such stories, sometimes buried deep in news reports—including the 30 people killed, three of them children, when US airpower “accidentally” hit a Doctors Without Borders hospital in Kunduz, Afghanistan, last October; or the two women and three children blasted to smithereens by US airpower last spring at an Islamic State checkpoint in northern Iraq because the pilots of two A-10 Warthogs attacking the site didn’t realize that civilians were in the vehicles stopped there; or the innumerable similar incidents that have happened with remarkable regularity and that barely make it into American news reports—I find I can’t quite achieve the cold distance necessary to accept our government’s tactics. And for this I blame (or thank) my father. To understand why it’s so difficult for me to gloss over the dead, you have to know that on December 1, 2003, a date I will never forget nor fully recover from, I called home from a phone booth on a cobblestone street in Switzerland—where I was backpacking at the time—and learned that my Dad was dead. A heart attack that struck as suddenly as a Hellfire missile. Standing in that sun-warmed phone booth clutching the receiver with a slick hand, vomit gurgling up at the back of my throat, I pressed my eyes closed and saw my Dad. First, I saw his back as he sat at the broad desk in his home office, his spot of thinning hair revealed. Then, I saw him in his nylon pants and baseball cap, paused at the kitchen door on his way to play paddle tennis. And finally, I saw him as I had the last time we parted, at Boston’s Logan Airport, on a patch of dingy gray carpet, as I kissed his whiskered cheek. US airpower has hit a bunch of other weddings, too. And funerals. And clinics. And an unknown and unknowable number of family homes. The CIA’s drone assassination campaign in the tribal regions of Pakistan even led a group of American and Pakistani artists to install an enormous portrait of a child on the ground in a frequently targeted region of that country. The artists wanted drone operators to see the face of one of the young people they might be targeting, instead of the tiny infrared figures on their computer consoles that they colloquially refer to as “bugsplats.” It’s an exhortation to them not to kill someone else’s beloved. Once in a while, a drone operator comes forward to reveal the emotional and psychic burden of passing 12-hour shifts in a windowless bunker on an Air Force base, killing by keystroke for a living. One serviceman’s six years on the job began when he was 21 years old and included a moment when he glimpsed a tiny figure dart around the side of a house in Afghanistan that was the target of a missile already on its way. In terror, he demanded of his copilot, “Did that look like a child to you?” Feverishly, he began tapping messages to ask the mission’s remote observer—an intelligence staffer at another location—if there was a child present. He’ll never know the answer. Moments later, the missile struck the house, leveling it. That particular drone operator has since left the military. After his resignation, he spent a bitterly cold winter in his home state of Montana getting blackout drunk and sleeping in a public playground in his government-issued sleeping bag. Meanwhile, Donald Trump and most of the other Republican candidates have been competing over who can most successfully obliterate combatants as well as civilians. (Ted Cruz’s comment about carpet-bombing ISIS until we find out “if sand can glow in the dark” has practically become a catchphrase.) But it’s not just the Republicans. Every single major candidate from both parties has plans to maintain some version of Washington’s increasingly far-flung drone campaigns. In other words, a program that originated under President George W. Bush as a crucial part of his “global war on terror,” and that was further institutionalized and ramped up under President Obama, will soon be bequeathed to a new president-elect.